In 1881, a group of Romany gipsies were travelling along the highway in their horse-drawn caravans, the final destination being the winter camp in Sherwood Forest. As they came along by Heaton Hall, it became obvious that one of the party was dying. When they reached Birch, they asked for help from members of the village and this was gladly given. The local doctor was called and later the vicar came to the caravan concerned. On September 4th 1881, the old man died. The whole village became drawn into the occurrence. It was a natural affair fur him to he buried under a hedge according to the gipsy custom. This pagan practice was not to be allowed by the local vicar- He must be buried in consecrated ground. After some deliberation, a compromise was made and he was buried as near to a hedge as possible where grasses grow high and hawthorn blossoms could fall down on him every spring. His own particular chair, garlanded, and a procession of his associates with their floral tributes were carried ta the grave and he was laid in the opening on his chair. When the opening was filled in, a single rose was placed on top to bloom every year. After the ceremony, the Romany gypsies moved on towards Sherwood Forest. Today the modern traveller disturbs the quietness of the countryside with the roar of his engine powered vehicle. Unlike the days of the last century when travel was taken at a more leisurely pace, when the soporific clip clop of the horse, as it pulled its load and the jingling of harness mingled with the lowing of cattle and chirruping birdsong enhanced the pastoral scene. So it was in the first week of September 1881, as a small convoy of gipsy caravans, en route to their winter quarters at Sherwood Forest, meandered into the village of Birch. In one of the caravans the life span of an old gipsy was slowly ebbing away. The services of a local doctor were prevailed upon, but the years on the open road and old age had finally taken their toll. The death of the old man caused some resentment between the gipsy folk and the authorities, for the Romanies wanted their kinsman to be buried Romany style among the hedgerows. A compromise was reached and he was laid to rest in the local graveyard. The sun was high in a brilliant blue sky as I stood one afternoon at the side of the old gipsy's grave, high on the south east corner about a metre from the hawthorn hedge on the eastern boundary of the graveyard. It looked derelict, unattended, the headstone partially hidden in the grass, blackened by factory smoke over the years and broken into two pieces lying on the ground at the head of the grave. Whether the headstone had been knocked over and damaged by vandals, I don't know, other headstones still stood upright. From the motorway nearby I could hear the faint continuous hum of traffic, but, unseen, a blackbird serenaded its mate and the world with a beautiful song. Across the green field one was made aware of the ever encroachment of sprawling housing estates crawling over the once rural community. In the far distance, thinly covered in a cloud like a gossamer veil, stood the hills outlined against the backdrop of blue sky. 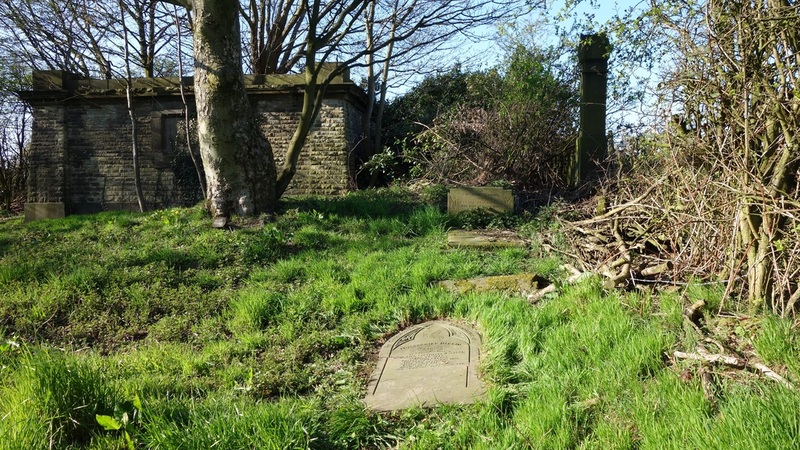 Four or five metres from the grave is the now blackened and vandalised tomb of the Hopwood family, the local gentry. Adjacent and amidst the ruin of the old church stands the memorial to the men from the village who lost their lives during both world wars. As I was reading I though I heard someone chuckling- It may have been my imagination as there was no other living person in sight The blackbird sill warbled his song and through a gap in the hedge I saw the white scuts of three rabbits in the field waving as they bobbed about nibbling at the grass. 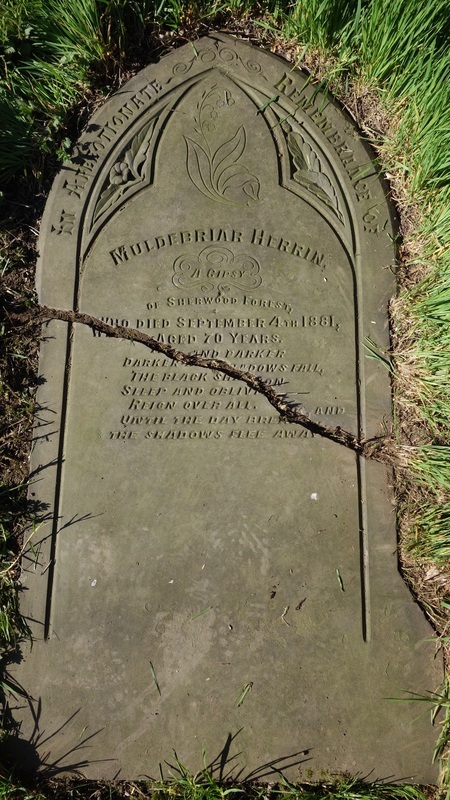 Looking once again at the fallen headstone, my eyes were drawn to the date on which the old gipsy had shed his mortal coil- The date on my watch was4th September l99l, exactly 110 years ago to the day on which Muldebriar Hennin ended his life's long journey.